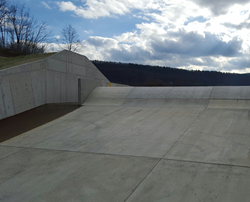 PENETRON ADMIX was employed to provide durability and waterproofing security to the crest of the spillway at the Colyer Lake Dam. The Central Pennsylvania project was completed by Christmas, ensuring the lake would be ready for boaters and fishermen this spring. Dam good: Close-up of the newly reconstructed bypass channel and emergency spillway crest, which was treated with PENETRON ADMIX in soluble bags. The ensuing reconstruction included a complete rebuild of the emergency spillway and armoring the embankment with an 11-foot thick layer of roller compacted concrete (RCC). Colyer Lake is a 77-acre reservoir located near State College created by a dam on Sinking Creek. It is a popular recreational attraction – for boating, fishing and swimming – in central Pennsylvania. However, due to the dubious condition of the dam and the emergency spillway, the reservoir had been partially drained to lower the water level and reduce stress on the compromised structures. PENETRON ADMIX – in pre-measured soluble bags to simplify the batching process – was used in the critical spillway crest to create a waterproof and durable structure. The admixture also eliminated the seepage problems, and the RCC armoring allows the entire embankment to act as an emergency spillway during any flooding situations. Finally, the Pennsylvania Fish and Boat Commission installed “fish features” that will make the lake bed more conducive as a fish and breeding habitat.